My marvelous mutt of a Redtick Coonhound has a stubborn streak that occasionally shows itself during our neighborhood walks. On one particular hot summer day, I found myself facing a battle of dog training wills with my hound dog Valentino planting himself in the middle of the road. My dog insisted he was going to walk one way while I wanted him to head in another direction. 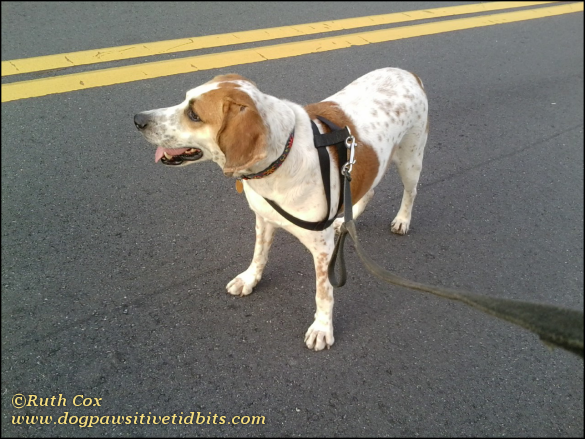 The leash in my hand stretched tightly to the limit, my hound stood his ground. 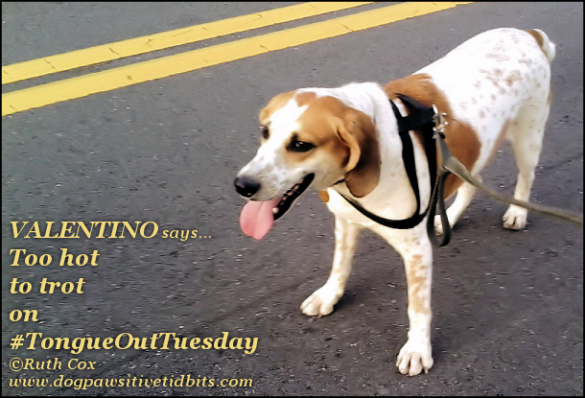 With feet planted firmly in typical independent coonhound fashion, Valentino totally ignored my "Let's go this way." tug and verbal command. I relaxed the dog leash just a bit and my dog stuck his tongue out at me! However, his stance relaxed and moved slightly in my direction. This made for a perfect picture for Tongue Out Tuesday! My dog Valentino says it's too hot to trot in the direction I want him to go! I relaxed my hold on the dog leash a bit more. My dog slowly stepped slightly in my direction but looked longingly at the other side of the road, where he preferred to go. Stubborn dog looks away in the direction he wants to go. With it being one of our seriously hot dog days of summer, I chose a drink of water as my aversion tactic. Tapping on our H2O4K9 Dog Water Bottle got my dog's attention. My thirsty hound dog moved in my direction as he glanced from the corner of his eye at what would be his positive reward for coming my way. My Thirsty Hound Dog Valentino looks and moves in my direction. 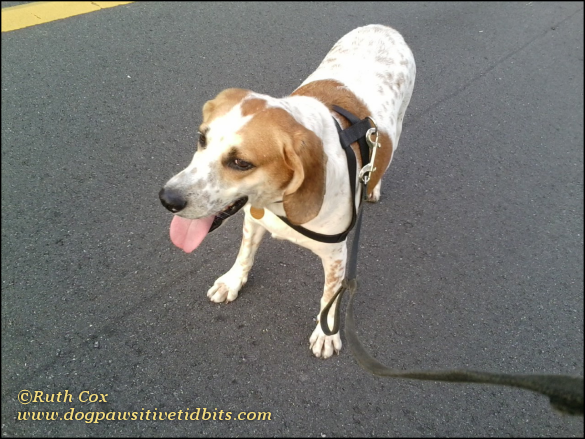 I was able to redirect the path of my stubborn hound dog using positive reinforcement, enabling us to turn the corner and head home for a cooling off in an air-conditioned house. 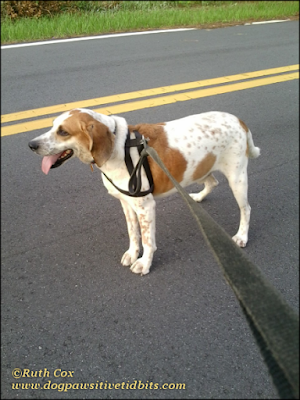 My hound dog Valentino, nose to the ground, walks our way home. Coonhounds are an independent breed of dog. However, with patient and positive dog training techniques we can turn these dogs around to become the best of hounds! Disclosure: Ruth Cox is an Associate of Amazon and may earn income based on purchases made through links in this article. I trust you have enjoyed this not-so-wordless dog walk with Ruthi and Valentino. 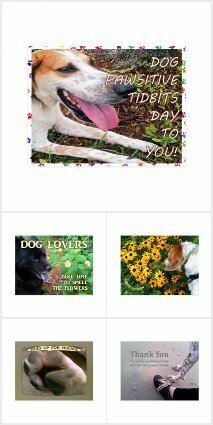 For more pets and pictures to read about and view, let your fingers do the walking as you head on over to BlogPaws for Wordless Wednesday!